Do your neighbours' borders burgeon with colour, and their containers drip with flowers while yours look brown and crispy? The fact is that some flowers are easier to grow than others - but your neighbour probably knows that already! 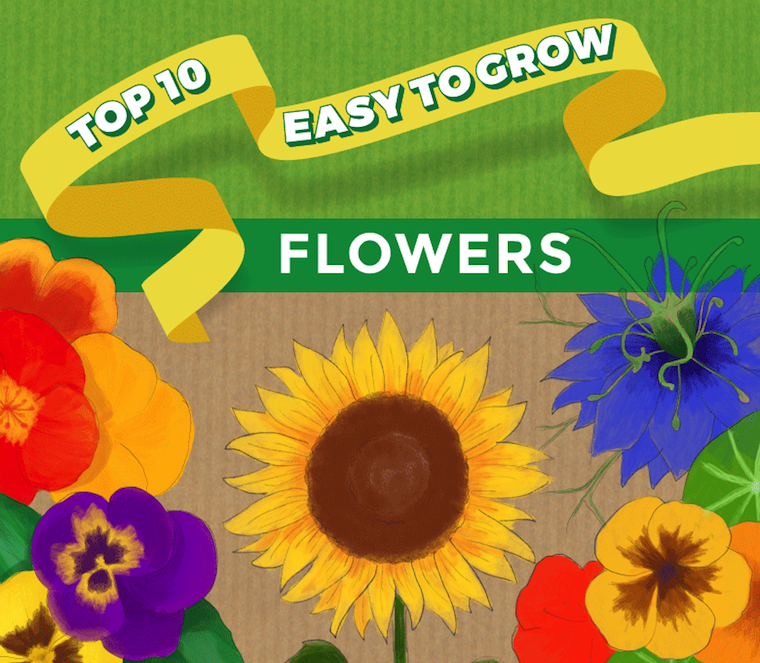 Read our list of top 10 easy to grow garden plants and discover the secret to a hassle-free summer garden. Read on to find out more, or scroll down to see the full infographic at the bottom of the page. 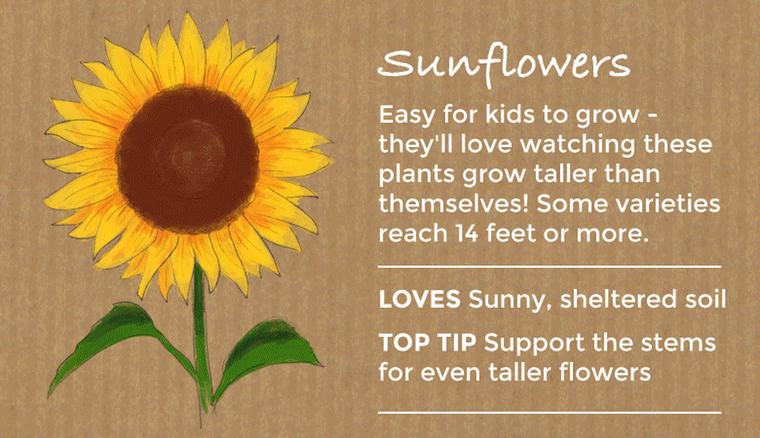 Always a favourite with kids - they'll definitely be impressed with Sunflower ‘Mongolian Giant’ growing up to 14 feet tall! 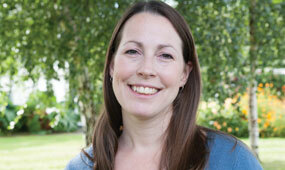 Just sow the seeds straight into the ground in a sunny, sheltered spot and watch them grow and grow and grow! Be sure to provide the stems with supports to grow the tallest sunflowers around. Irresistable fragrance and prettiness! And the more you pick, the more flowers they produce! The large seeds of sweet peas are easy to handle, but if sowing sounds complicated then buy them as sweet pea plug plants! A sunny spot, a supportive fence, and regular watering is all these climbers need to produce your own 'home grown' cut flowers. Just keep an eye out for mice, slugs and snails - they love the young shoots. Consider covering with a mini cloche, or even a cut-off plastic bottle. 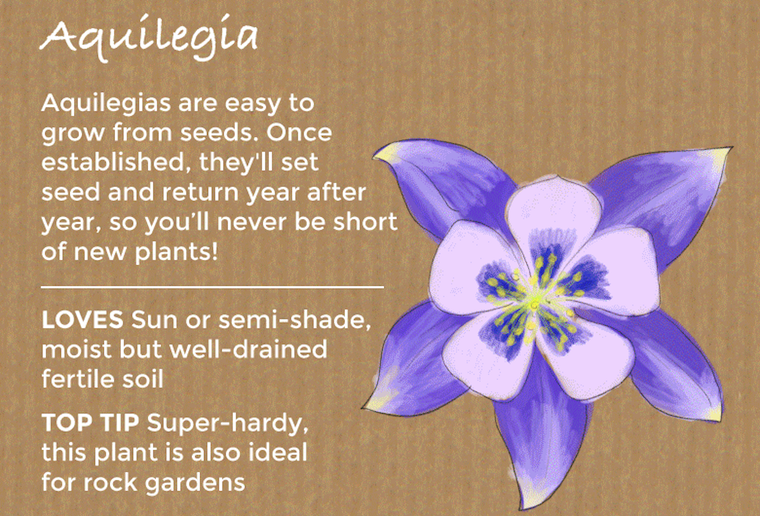 Nigella is an incredibly easy plant to grow. Simply scatter nigella seed across a patch of bare soil and let it look after itself! 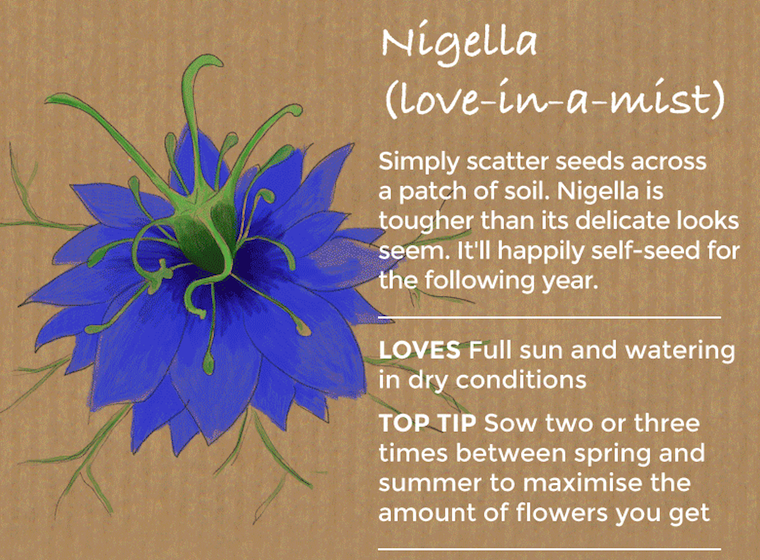 With jewel-like flowers and delicate ferny leaves, nigella is much tougher than it looks. As the flowers fade, this pretty plant will set seed for the following year. What could be simpler! Aquilegias are easy plants to grow from seeds and will come back year after year. Start aquilegias in small pots for transplanting later on. Once they're established they'll self-seed, so you'll always have fresh plants each year. They tolerate almost any conditions in sun or semi-shade, and their pretty bonnet-like flowers come in almost every imaginable colour combination. If you are not a fan of watering then Eschscholzia make easy to grow plants for your garden. These colourful little annuals thrive in poor, dry soil and full sun so they are perfect for filling forgotten corners of the garden. Just scatter them where you want them to flower and let them take care of themselves. Each year they will set seed which will grow the following summer, creating effortless drifts of colour. 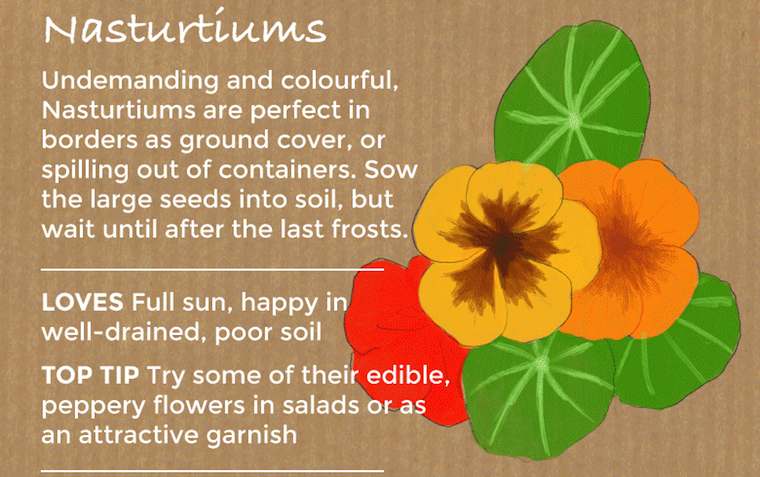 Quick-growing and colourful, nasturtiums are easy plants for children to grow. Sow them in borders as ground cover or let them spill out of containers. The large seeds can be sown directly into the soil - just wait until after the last frosts. Their peppery leaves and flowers complement and garnish summer salads. These easy to grow bedding plants are another great choice for young gardeners. Marigold seeds are easy to handle, and grow quickly so you'll have a short wait for their colourful flowers. From tall varieties for the border to small types for beds and containers, there's a marigold to suit every sunny spot in the garden. Cranesbill is so popular because it's a reliable, low maintenance, ground cover that will wander through your borders year after year. Hardy geraniums are not difficult to grow from seed but you can grow them from bareroots which is even simpler. Easy to grow patio plants when grown from plugs, and best loved for adding colour to hanging baskets and containers. Fuchsias come in all colours and shapes, from trailing to upright you could even try the climbing fuchsia ‘Lady Boothby’ for an ambitious display. For a really professional look, pinch out the very tips of each stem while the plants are still young to encourage lots of bushy growth. 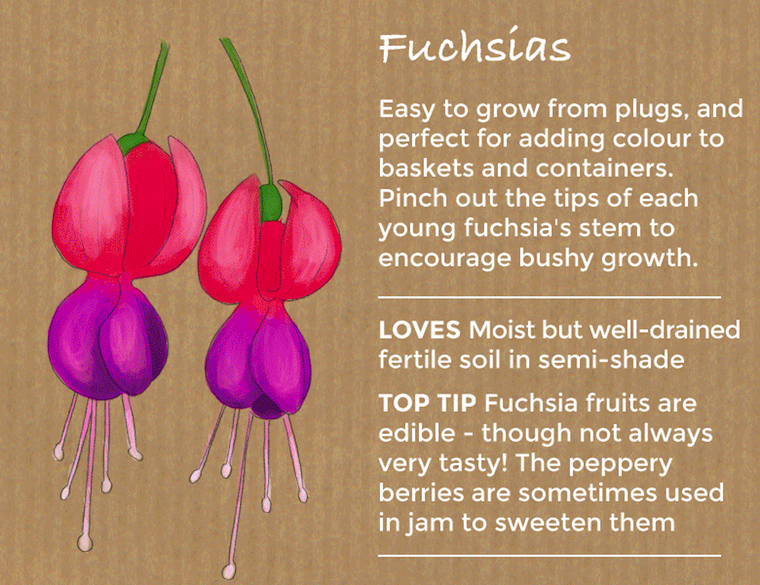 Fuchsia erries are edible, but not always tasty! With their cheery faces, it’s hard to resist the appeal of pansies. 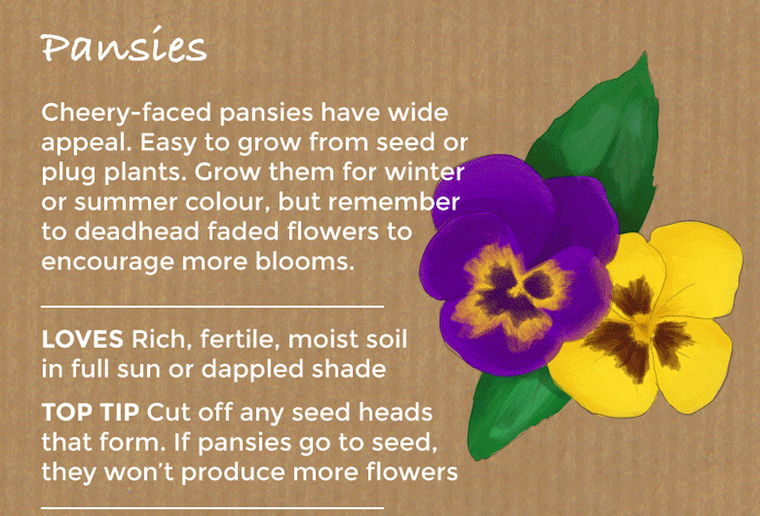 These garden favourites are easy plants to grow from seed but even easier from pansy plug plants. 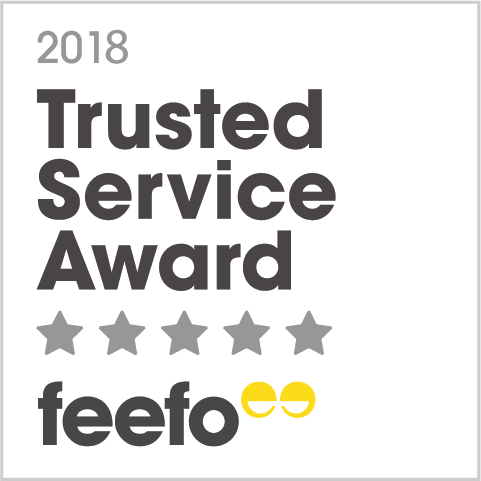 Whether you grow them for winter or summer colour, deadheading faded flowers will encourage more and more colourful blooms. Here's the infographic in full - if you'd like to share it or use it on your own site, check out the details underneath.